Connecticut is a state full of history and culture, and it features some beautiful landmarks you don’t want to miss. Bushnell Park is one of them! This stunning park has been a part of Hartford’s heritage for the past 150 years and makes for the perfect day trip when you are staying at Stonecroft Country Inn. Admire a variety of old trees, ride the carousel, take a tour, or catch a show at the performance pavilion! Read on to find out why you should visit Bushnell Park and start planning your trip today. Bushnell Park came to be with the booming benefits of the industrial revolution in the mid-1800’s. It all started when Reverend Horace Bushnell presented the idea to build a park with public funding — something that had never been done before! In 1854, a few years after the land was purchased, the first municipal park in the nation came to life. 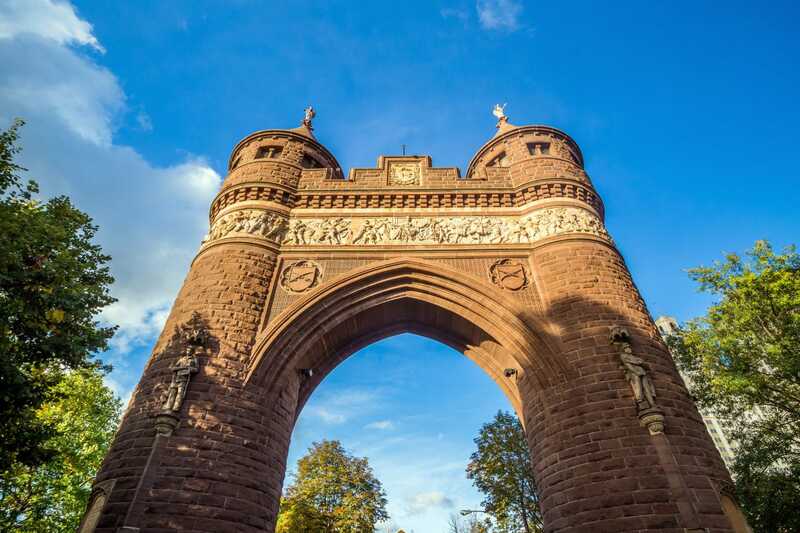 The sail and sailors Memorial Arch is the main attraction in Bushnell Park. Designed by Hartford architect George Keller, it is dedicated to the remembrance of the battle of Antietam during the Civil War. Tip: Take a tour of the Arch! From May to October, book a 20-minute visit and learn more about the rich history of Hartford and Bushnell Park. There is a lot to do and see in Bushnell Park. Whether you want to have fun or simply relax, you will be more than satisfied. Here are all the great things you can do during your visit. If you love nature, you will enjoy the wide variety of trees at Bushnell Park. Over 150 species are planted there, including Chinese Toon, Hardy Rubber Trees, Turkey Oak, as well as Charter Oak. A tree walk makes for a nice morning stroll! Get lost in a vintage dream at the Carousel at Bushnell Park. This 1914 carousel operates on Saturdays from 11 a.m. to 5 p.m. and costs $1 per person. If you are traveling with kids, it’s a wonderful activity! Tip: The carousel is closed January through March. The performance pavilion was added to Bushnell Park in 1995 and hosts several events throughout the year. The 3,000 square-feet stage is perfect for dance performances, concerts, and even theater! Check the calendar to see if a show is happening during your visit. The Corning Fountain is an interesting stop in the park thanks to its unusual theme. Classical style, typical of the late 1800s, was not used; instead, the fountain has a Native American theme, with a stag surrounded by statues of Saukiog Indians who called the Hartford area home first. 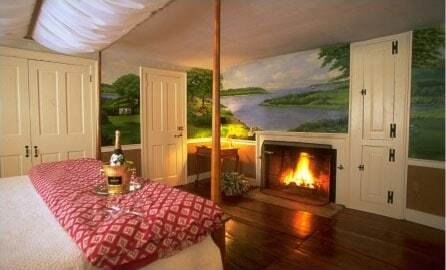 After spending the day in the sun at Bushnell Park, come home to a comfortable room at Stonecroft Country Inn. All that time walking around in the city and in the park is tiring, so we want you to relax and unwind in our authentic New England Inn. Our stunning amenities are perfect for a romantic getaway, and we even offer specials such as spa treatments for our guests! Take a look at our accommodations and pick your favorite. The Buttery Room, for example, is the emblem of comfort and timeless elegance. Picture yourself waking up to soft morning light through the window, with the sound of birds chirping right outside and a hot cup of coffee in your hands. The beamed ceiling and original doors add to the charm of the room and transport you into a serene and peaceful atmosphere every time you step in. Before starting your new adventure of the day, join us at the main inn for a delicious homemade breakfast! 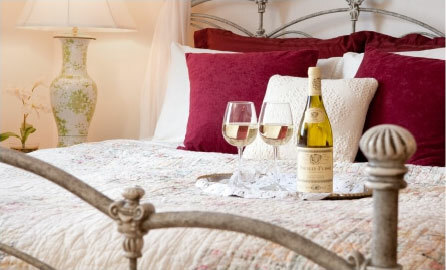 Book your stay at Stonecroft Country Inn today! We can’t wait to meet you.